This card is very playable now. Works out fantastically with Flamewreathed Faceless, can be used as a finisher in Midrange Shaman. Lose 3 stats and you need to have something with attack on board, which can be tricky for shamans. Also, turn 4 is currently a bit occupied for shamans, as it turns out. Solution: Charge. Reckless Rocketeer for instance. I've had good success running one in a deck with Fireguard Destroyers. 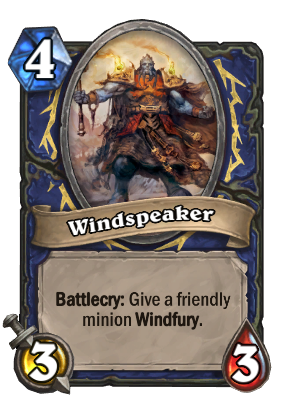 With 6 hp and high attack they make perfect windfury targets, it also does not sit in your hand because you have both shredders and destroyers to play on turn 4. Windspeaker x 2 are a reward for raising a shaman to level 8. Golden Windspeaker is a reward for raising a shaman to levels 45 and 46. Blizzard likes to be... Special. Don't make fun of them.